The Battle of Asheville, April 6, 1865, was fought during the Expedition to Asheville (April 3 to April 11, 1865) and was an unsuccessful Union attempt to capture Asheville, North Carolina, during the last month of the American Civil War. Union Colonel Isaac M. Kirby was instructed to make a demonstration, press the battle, and capture the city if it could be done without serious loss of life. Although Kirby believed that he was confronted by an enemy force of at least 1,000 soldiers, his command had engaged and been repulsed by a scant force of 300 Rebels. On April 8, Union Major General George H. Thomas, commanding Department of the Cumberland, wrote that Asheville was too strong for Kirby to attack, but he downplayed the expedition by saying that the city was cut off from reinforcements and therefore of no importance. Asheville had a population of 1,100 in 1860 and was the largest city in western North Carolina. During the Civil War (1861-1865) it hosted an armory, which manufactured Enfield type rifles until 1863, several prisons, as well as some training camps and fortifications. For most of the conflict, while the Tar Heel State's coastal towns and ports had endured frequent Union bombardments and attacks, Asheville, besides being the object of a few raids, was absent any major Union assault. The pristine mountain community, nevertheless, suffered the privations familiar to many other Southern cities. In the first week of April 1865 the dynamics of the conflict had changed, however, because Gen. Robert E. Lee, after a nearly ten month siege at Richmond-Petersburg, had moved the battered Army of Northern Virginia toward Appomattox, causing the Confederate capital of Richmond to capitulate on April 3, and less than one week later, on April 9, Gen. Lee would surrender to Lt. Gen. Grant. Emboldened by Richmond's demise, Union commanders were no longer appeased with their harassing raids against the mountain enclave, because Maj. Gen. David S. Stanley, commanding IV Corps, Department of the Cumberland, having command over neighboring East Tennessee, issued orders for a direct assault on Asheville with the objective of capturing the city, if it "could be effected without serious loss of life." One of the youngest colonels in the Confederate Army and a decorated Union officer would command opposing armies during the Battle of Asheville. At age 23, George Wesley Clayton was a Confederate colonel who had attended West Point, only to resign one month prior to graduation in order to serve his home state of North Carolina. Colonel Isaac Minor Kirby had led the 101st Ohio Infantry before being brevetted to brigadier for gallantry during the Atlanta Campaign, Battle of Franklin, and various actions around Nashville, and he would lead a brigade in an attempt to capture Asheville in April 1865. On April 6, 1865, on the outskirts of Asheville, Colonel George Clayton* mustered a force of 300 Confederates and—with two small brass Napoleon cannons—marched them to rough earthworks on a hill that overlooked the French Broad route being used by Union Colonel Isaac Kirby’s 1,100-man brigade. When Kirby encountered the Confederates, he quickly maneuvered his soldiers to a safe distance and behind trees, and at 3 o’clock in the afternoon, the opposing sides began firing. Although neither side sought to improve its position during battle, both armies continued to exchange small arms fire while Confederate cannons occasionally fired toward the Union position during the five hour fight. Unable to dislodge the stubborn Rebel contingent, and concerned that enemy reinforcements could press their position by morning, the Union brigade withdrew at 8 p.m. Whereas few casualties were reported by both sides, it was a short-lived tactical victory for the Confederates. Asheville, the largest city in western North Carolina, was conveniently situated in the heart of the Mountain Region and hosted the only major highway with a direct route from East Tennessee to South Carolina. The strategic value of the city was not vested in its armory, with a negligible production of rifle-muskets, its few training camps, nor its ability to sustain and prolong the conflict, but with the city's location. If the Union army occupied the city it would cause the region to be split into two sections, and it would shorten the distance to Columbia, the capital of South Carolina. 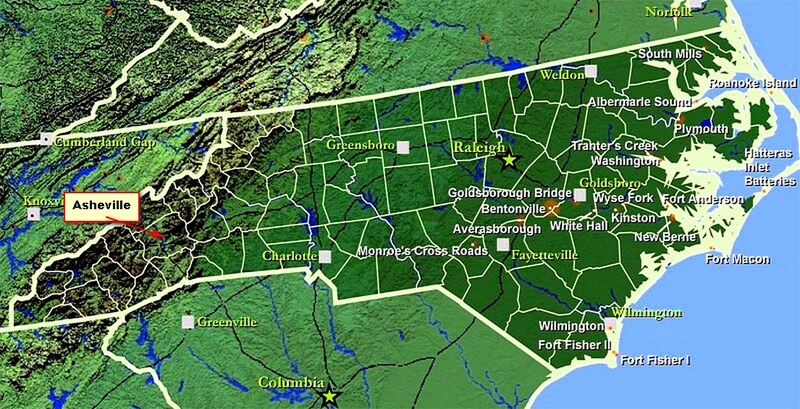 Since Federal forces were already pushing inland from North Carolina's coastal cities, to gain a foothold in the western part of the State would easily place Raleigh, the host capital, in the clutch of a pincer movement from both the east and west. The 1860 U.S. census shows that Buncombe County had a total population of 12,654, including 1,933 slaves and 100 free blacks. The county seat of Asheville totaled 1,100 citizens and according to the slave schedules enumerated on August 16, 1860, the mountain city listed an additional 750 slaves. In 1860, slaves comprised 15% of the populace of Buncombe County, 68% of the total inhabitants of Asheville, and 33% of the total state population. By 1860, Asheville dominated the region politically and economically and was a large trading center for the immense variety of goods that were arriving from Europe via ports of Wilmington and New Bern and from other rich seaport cities of the Deep South such as Charleston and Savannah. Merchants from Kentucky, Virginia, Georgia, and Tennessee would arrive daily in Asheville to purchase and exchange an abundance of commodities including livestock and cash crops. By all standards, Asheville had become the economic center for the region by 1860 and was enjoying the status of a boomtown. Because the Buncombe Turnpike spanned from East Tennessee to the South Carolina border, western North Carolina was an open highway allowing any sizeable force a direct route into the backcountry of the rebellion. When the turnpike was completed in 1828, Asheville would celebrate it first economic boom and some of its citizens would soon be numbered among the wealthiest in the state. By capturing nearby Knoxville in 1863, the Union army was able to use the largest city in East Tennessee as a forward operating base and launch incursions into western North Carolina. If the Federals controlled Asheville, then it would also control the railroads. Neighboring East Tennessee hosted the only railroad in the area, making it critical to the lifeline of the Confederacy. Since there were no railroads in the vicinity, the Buncombe Turnpike served as the main route for transporting all livestock and necessaries between western North Carolina and eastern Tennessee. The mountain enclave served as the staging area for forwarding cavalry, infantry, and munitions to the defense of the Confederacy's railroads and depots in East Tennessee. The wartime rails hosted the only tracks available for the quick transport of troops, ammunition, and provisions to the front and between the war's two major theaters in the east and west as well as to check any large Union army moving into the region. For any army hoping to arrive in North Carolina by way of Tennessee, the heavily traveled Buncombe Turnpike in Asheville was the preferred route since it hosted the only major highway and inroad to South Carolina. In defense of the Buncombe Turnpike, the North Carolina units serving in the mountains would form a thin gray line by concentrating their depleted resources along the ridges of the turnpike and on the shared border with southwestern Virginia. The Mountain Region was also the location for any reserve force which could be called out at a moments notice for the defense of the South's major producer of salt in southwestern Virginia. Western North Carolina was home to Camp Vance, a military recruiting and training facility, and an armory that produced some 900 useable Enfield rifles before the facility was moved to Columbia, South Carolina, for strategic reasons. The constant threat of a large Union force moving into the area would be met by Confederate commands forwarding their brigades and regiments from several locations to engage the foe. Large Federal incursions were seldom, but a constant threat was lurking in the midst of the Rebel controlled territory. Enjoying the densely covered mountains as a preferred haven were deserters and bushwhackers who roamed the landscape in search of vulnerable homesteads and easy targets to pillage and plunder. With able-bodied men marching with their units to the drums of war, women, absent husbands and sons, often found themselves isolated and alone while being subjected to nonstop terror. Toiling the fields and struggling to provide for their young children, and for the growing number of orphans and widows, were often the words that the battle weary husband read in the many letters received from home. As the war continued so did hardships. The agonizing pleas from a wife can be recalled in wartime letters as she begged her husband to come home because one of their children had recently died of disease and because the cabin had been plundered by bushwhackers who took the scarce provisions that remained and were needed in hopes of making it through the approaching winter. The men of the Mountain Region who deserted the army generally made the decision based on hardships at home. To the south of western North Carolina was the hotbed of the rebellion called South Carolina, and the odds were slim to none of a large Union force moving through that area uncontested by a sizeable Confederate command. A bulky Union army with its artillery and wagons had to march down the old Buncombe Turnpike to arrive at Asheville, but it would be very risky. As the only inroad that could accommodate wagons and a large contingent, the turnpike, at first glance, seemed like a quick road into the region, but the route meant that a frontal assault would occur as the clamoring army pushed directly into the backyard of Asheville. 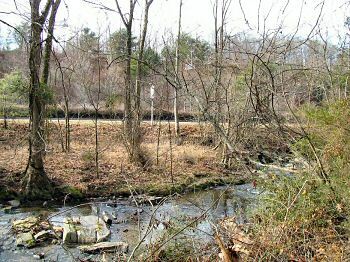 As the Yanks moved south and through many obstructions on the Buncombe Turnpike they would be greeted by pickets and ambushes along the route before moving headlong into well rested Rebel artillery, which would be conveniently straddled atop the ridges as they formed a firewall of lead and iron. But there was another option, the Union military could haul its cannons and wagons on a hard trek over the Smokies during a time consuming and rather exhaustive circuitous route into Asheville. The Federals will have tried all the above by the time 1865 ushered in the cessation of hostilities. While Union Maj. Gen. George Stoneman pushed his 6,000-strong cavalrymen into the mountains of the Tar Heel State during the last week of March 1865, Confederate Brig. Gen. James Green Martin, commanding District of Western North Carolina, reported on March 31, 1865, that "I have nothing to report but disobedience of orders, neglect of duty, demoralization of the people, and desertion of both officers and men. I regret to say further that from present appearances there is no prospect of things being any better." And when Gen. Robert E. Lee and the battered Army of Northern Virginia abandoned the Confederate capital of Richmond to Lt. Gen. Ulysses S. Grant during the first week of April, Col. Isaac M. Kirby was moving his 1,100-man brigade in the direction of Asheville. Although Asheville—a secluded mountain community nestled in western North Carolina—hosted the most traveled route to and from East Tennessee, as well as a principal training camp and armory during the American Civil War, it remained a contest of wills during the conflict. (Right) Col. Isaac Minor Kirby (Feb. 10, 1835-May 30, 1917), date unknown. At age 26 Kirby was elected captain on April 27, 1861, of Company I, 15th Ohio Volunteers. He later served as Colonel of the 101st OVI, and then as commander of First Brigade, First Division, Fourth Corps, Department of the Cumberland. On January 12, 1865, he was given a brevet promotion of brigadier-general for meritorious services rendered throughout the war. The famed Buckeye would outlive most veterans of the conflict. During the First World War and one month after the United States declared war on Germany (April 6, 1917), Isaac M. Kirby died at the age of 82. Rebel George Wesley Clayton was a 23 year old Asheville native who had attended West Point. He was also a descendant of Revolutionary War stock and a veteran of guerrilla warfare. His adversary was Ohioan Isaac Minor Kirby, commanding First Brigade, and he was a 30 year old battle-hardened veteran of Stones River, Franklin, Nashville, and the Atlanta Campaign. Commanding the Western District of North Carolina from his headquarters at Asheville, Brig. Gen. James Martin, who fell ill while leading a brigade under Lee, directed the Confederate forces in the area during 1865, while Kirby's brigade, operating in East Tennessee, March 15-April 22, 1865, was attached to First Division, Fourth Corps, Department of the Cumberland. On April 3, 1865, at 2 p.m., Col. Kirby was near Greeneville, Tennessee, when he received orders to begin moving his brigade on an "expedition with ten days' rations" along the French Broad with instructions to capture Asheville, and he was complemented by a number of deserters familiar with the terrain. Kirby was instructed to "scout in the direction of Asheville" and "not to attack the enemy unless he could do so with every prospect of success and without serious loss of life." 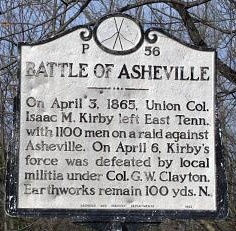 Conflicting Union reports indicated that the Rebel strength at Asheville ranged from 400 to as many as 2,600 men, commanding twenty artillery pieces, but Kirby, on April 6, having been persuaded of the enemy strength during a conversation with a rebel deserter, a lieutenant who had remained in service merely to forward exaggerated troop strength, believed that the force awaiting him at Asheville numbered some 2,000 men plus as many as twenty guns. Actual Rebel troop strength was scarcely 300, however. Col. Kirby, believing he was outmanned and outgunned by the Confederate force at Asheville, advanced cautiously along the French Broad River with his brigade of 900 infantrymen and 200 partisans, including deserters who had pledged an oath of allegiance to the United States, two field guns, and a train of wagons. Kirby's brigade, consisting of Ohio, Indiana, and Illinois regiments, bivouacked the night of April 4, at Warms Springs—present-day Hot Springs, N.C., and located on the Tennessee-North Carolina line—and on the morning of April 5, the Union colonel, having marched his force some four miles in the direction of Asheville, was met by three rebel deserters, including a lieutenant who had remained in rebel service only to forward misinformation to Union forces. Hearing the words of the senior ranking deserter, Kirby now ascertained that the enemy he confronted was nearly 2,000 strong, had about twenty guns, including twelve napoleons, held the high ground, and was supported by 600 men to the west, so he ordered his two field pieces (Battery G, First Ohio) and wagons back to the safety of Warm Springs, preventing the enemy from capturing them, and pushed his brigade toward the objective at midnight. And crossing the French Broad and burning two bridges on the morning of April 6, the Union force pushed toward the prized city. Kirby would remain in view of North Carolina home guard and pickets while moving his army down the Buncombe Turnpike toward Asheville. Spanning seventy-five miles in length, the Buncombe Turnpike, which followed along the French Broad River from western North Carolina and into Tennessee, was the most traveled road in the region, with livestock and wagons traversing it annually. During the war the Confederates had cut down trees, hauled large rocks and other structures, and covered the turnpike, thus obstructing and hindering any Union force from rapidly advancing on the greater Asheville area. When Kirby marched on the road in 1865, he complained of its extensive obstructions impeding his progress. Although the Union colonel ordered his cannons and wagons to remain at Warm Springs, fearing that if his horses were shot the Rebels would capture the spoils, the debris on the road reinforced Kirby's decision to travel lightly. While the Union brigade approached Asheville and prepared to capture it, Col. Clayton, commanding 62nd North Carolina, anticipating the Federal troops, was determined to hold the ground with a force of merely 300. Clayton, well-versed in the topography of Asheville, had attended West Point and battled Typhoid Fever in 1863, and the men forming the nucleus of his 300 strong force were 175 veteran soldiers from his regiment, the 62nd North Carolina, and they had a long-standing reputation for fighting bushwhackers and guerillas while evading superior Union numbers. The 62nd, having rebuffed repeated orders to surrender in 1863, was one of the Tar Heel State's last units to surrender during the war. 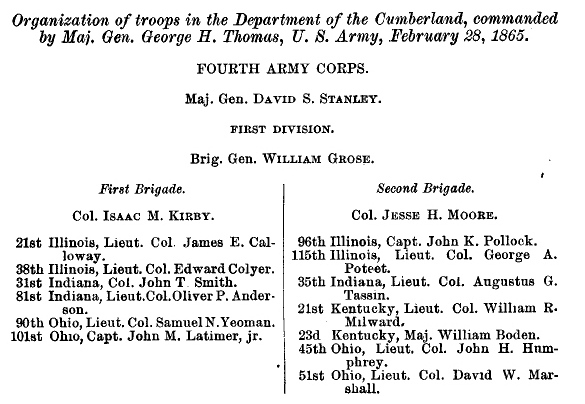 The prevailing fragment of the regiment composed part of Palmer's Brigade at Asheville on March 10, 1865, and at the direction of Brig. Gen. James Martin (nom de guerre of "Old One Wing" because of a wound sustained during the Mexican War), it remained under Clayton's command and would engage in the pitched battle against Kirby's brigade near Asheville, "the most prominent city of the state's mountain region," on April 6. Clayton was also assisted by a company of the Silver Greys and some Confederate soldiers at home on sick leave and furlough. The Silver Greys, officially known as Captain Lee’s Local Defense Company, consisted of senior and junior reserves, which served as home guard, and totaled 44 men, including a 14 year old boy and a 60 year old Baptist minister. To the west of Asheville, 600 men of Thomas' Legion of Cherokee Indians and Highlanders, a diverse unit of the rugged region, having bivouacked between Waynesville and Warm Springs, were poised for action should any Northern troops exercise the thought of an intrusion. Although the service of Thomas' Legion was not requested nor needed against Kirby, the legion was as close as 20 miles from Warm Springs and 25 miles from Asheville. 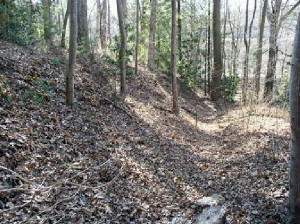 While the Union brigade was advancing on Asheville, the 300 commanded positions on the ridge, the high ground (the location is currently known as Broadway Street). Kirby, having been convinced of the rebel strength by three Confederate deserters on April 5, "was of the opinion that there were 1,000 or 1,500 men in Asheville, and 400 cavalry on his left flank and 700 on his right." Whereas the brigade closed ranks, it pressed the battle by charging the pickets on the Confederate left. While there was initial maneuvering, the armies fell back, held their position, and for five hours exchanged sporadic volleys until 8 o'clock that night. Although the Union army had greatly outnumbered the Confederates during the slugfest, the Yankees were compelled to retreat, and Union and Confederate casualties were reported as few. En route to support Kirby was McConnell's brigade, which had been ordered by Gen. Wood at 8 a.m., April 6, to move from East Tennessee to Warm Springs. 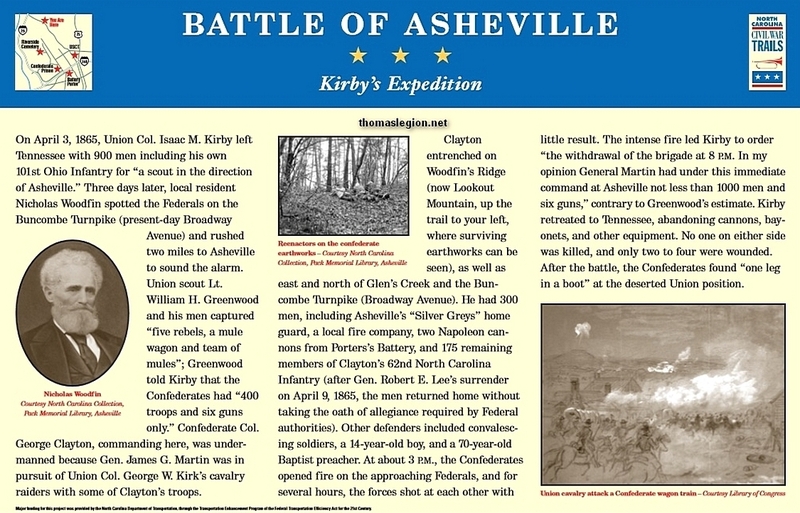 At about 3 p.m. on April 6, Kirby found the enemy in a position less than two miles northwest of Asheville "occupying the high hills." Determined to march on the streets of Asheville, he forwarded his brigade and drove back the Confederate left, only to view the enemy's right flanking the Union rear. During the demonstration, five rebels, a wagon and team of mules were captured. Kirby, in another report, was under the impression that the force he confronted belonged to Brig. Gen. Martin, consisting of "not less than 1,000 men and six guns, and could be re-enforced before morning with 400 or 500 more men," while another man stated that 300 rebels had already camped behind the Federal position, thus cutting off the principal route of retreat. Not willing to "sacrifice the life of one man for the town of Asheville," reported Kirby, he consulted with one Colonel Yeoman and other Union officers, who were of the opinion that the "the enemy meant to fight." Although reporting in one account that he awaited McConnell to move from Warm Springs to Asheville, McConnell, on the other hand, reported that he had been waiting for Kirby to fall back to his position. Having two men seriously wounded in the battle, Kirby, retreating to Warm Springs and finding McConnell's rested brigade, continued the Union contingent in an orderly retreat back to Greeneville. Kirby's actions showed that he lacked conviction to press the assault on Asheville, not to mention capturing it, because he left his field pieces and wagons, having been stocked with ten days' rations and supplies, some 50 miles to the north at the safety of Warm Springs, which allowed the brigade a quick exit should those contrived 1,100 cavalry thrash his position. Absent was also any maneuvering of his brigade, for he had ample time, five hours, to ascertain the position and strength of the enemy, which he later conceded was merely a small force of rebels with two cannons that entertained him from two field works on a hill. Whereas Kirby refused any flanking movement, he did perform a demonstration before the Confederates, who had used the topography to its advantage. Perhaps he was hoping that the Confederates would exhaust their ammunition and withdrawal, or melt away like fluke flurries in the springtime, and then he would move toward the city in piecemeal fashion. (Left) The site of the breastworks, or earthworks, is now part of the campus of the University of North Carolina at Asheville. (Right) View of the Asheville battlefield. Confederate artillery was placed on the hills across the road. The battle's historical marker is also in the background. Kirby's plans excluded his artillery and wagons, which contained rations, supplies and provisions necessary for a prolonged fight, and corroborated the mindset and lack of conviction of the war-weary Buckeye, because although instructed to move on Asheville, he had no intention on risking any loss, for he conceded by saying that "he would not sacrifice the life of one man for the town of Asheville." Kirby, however, was instructed, "not to attack the enemy unless he can do so with every prospect of success." But, on the other hand, if the Tar Heels would have withdrawn at anytime during the five hour ordeal, then perhaps the Ohioan would have pressed and settled into a defensive position until McConnell's brigade or Kirk's two regiments, which he knew were operating in the area, reinforced or relieved him. After Gen. Robert E. Lee surrendered the Army of Northern Virginia to Lt. Gen. U.S. Grant on April 9, 1865, the Confederates serving with Col. Clayton in Asheville withdrew and returned to their homes. The Rebels never swore the oath of allegiance as required by Federal authorities, and Lt. Col. Byron Gibbs McDowell, serving with the 62nd, wrote that "No braver or nobler hearted men ever lived than those composing the Sixty-second North Carolina." McDowell, having survived several gunshot wounds while fighting bushwhackers, was a citizen of Waynesville (near Asheville), and was the savior of the six hundred, including many of the 62nd, because, while evading capture in September 1863, he led the troops on a heroic charge through Union lines in the Cumberland Gap. Many of these men were present during the Battle of Asheville. Although Asheville had averted capitulation, it was soon captured, April 26, during Stoneman's Cavalry Raid. The city's fall, however, occurred almost two weeks after Lee's surrender to Grant at Appomattox, but coincided with Gen. Joe Johnston's surrender to Maj. Gen. William T. Sherman at Bentonville, North Carolina. Although many argue that the battle was a skirmish or that the fight really didn't make a difference since the war would soon be over, the reader is encouraged to refrain from any tacit outcome. The Expedition to Asheville, 3 April to 11 April 1865, as it was called, was a well-planned yet unsuccessful Federal attempt to capture Asheville. Although there were only a few casualties, this factor or outcome does not determine whether or not it was a battle. A battle by definition has an objective, such as capture Asheville, and is fought to a definite decision between organized armies or forces. A skirmish, on the other hand, is considered a brisk or minor encounter between small bodies of troops, especially advanced or outlying detachments of opposing armies. 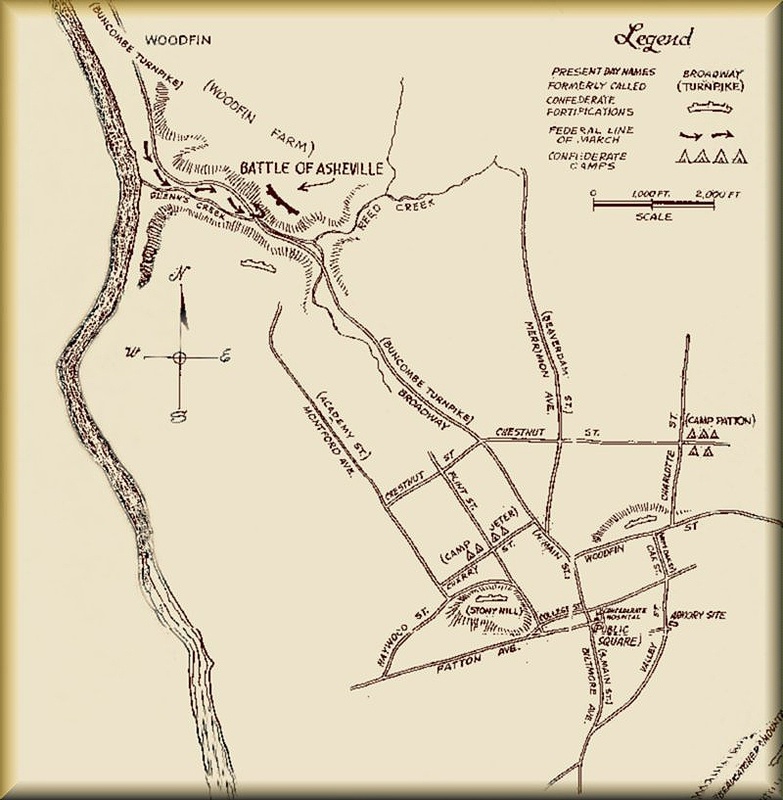 At Asheville, there was an objective and there were two organized forces, not skirmishers or pickets, that had engaged and fought for five hours. There was a clear or decisive outcome, too. The Union brigade was repulsed. Asheville, according to many Union and Confederate letters and diaries, was hated by many Federal soldiers because it had escaped hard war. The mountain city was also host to the largest community in the mountains and while it remained open for commerce and transportation, so would the remaining communities of Southern Appalachia. If the 1,100 strong contingent had pushed into Asheville, the probability of extensive looting and burning of the city was a plausible scenario. The fact is that 300 men on 6 April 1865 refused to allow us any other outcome save one, the Union army was repulsed. Col. Kirby would leave his two field pieces and wagons at Warm Springs guarded by "two regiments," so if overrun by the 1,100 cavalry that he opined to be on his flanks, he could quickly withdrawal without loss of the guns and wagons. While the Buckeye would receive one dispatch informing him that a brigade was en route to reinforce his position, he remained convinced of a superior Confederate force awaiting him at Asheville. Kirby, moreover, believed that he had an opportunity to assist Maj. Gen. George Stoneman, who was also operating in the area, by forcing the larger Rebel force to engage his brigade at Asheville. The scant Confederate force that awaited Kirby, however, was not in the position to press any offensive, but that may also be attributed to one Rebel lieutenant who had happily reinforced the Federal belief of the superior numbers in the area. By making a demonstration before the mountain city, it would keep the Confederates from pursuing Stoneman, the Union colonel thought, and then Kirby could casually retire to the safety of Tennessee. But just as Kirby was readying his brigade in East Tennessee for its move down the Old Buncombe Turnpike and into North Carolina, jubilant news arrived. General Lee had abandoned Richmond and the Confederate capital had been captured! It was at that time that Kirby, having already embraced a trepid approach toward Asheville, was determined not to press the battle and risk any losses—because the war was all but over. But as stated, if Kirby had not encountered such enemy resistance, the outcome may have been entirely different. After the engagement, and with conviction, Kirby wrote that he "would not sacrifice one man for the town of Asheville." Having good reason not to force the battle, Kirby had averted unnecessary loss of life for both Union and Confederate forces that day. Three days later Lee surrendered to Grant. *George Wesley Clayton (June 4, 1841-February 22, 1898) was admitted to the United States Military Academy at West Point on July 1, 1858, and resigned in May 1861, one month prior to graduation, in order to render services to the Confederacy. His Class was scheduled to graduate in June 1862, but because of exigencies of war it was rescheduled for graduation in June 1861. Perhaps no other group reflected the nation’s divisions more starkly than West Point’s graduating classes of May and June 1861. Due to the outbreak of war, the class that was to graduate in June 1861 graduated six weeks earlier in May and the class that was to graduate the following year in June 1862, graduated 12 months early in June 1861. At this time, secession became a tortuous decision for many of the cadets. Secession demanded loyalty to one’s State but the Academy taught loyalty to the United States and emphasized the notion of ‘Duty’, but ‘Duty’ to whom? Stoneman's Raid, A series of fierce cavalry raids through Western North Carolina: "An Historical Marker Tour"
Recommended Reading: Confederate Military History Of North Carolina: North Carolina In The Civil War, 1861-1865. Description: The author, Prof. D. H. Hill, Jr., was the son of Lieutenant General Daniel Harvey Hill (North Carolina produced only two lieutenant generals and it was the second highest rank in the army) and his mother was General “Stonewall” Jackson’s wife's sister. In Confederate Military History Of North Carolina, Hill discusses North Carolina’s massive task of preparing and mobilizing for the conflict; the many regiments and battalions recruited from the Old North State; as well as the state's numerous contributions during the war. Continued below. Recommended Viewing: The Civil War - A Film by Ken Burns. Review: The Civil War - A Film by Ken Burns is the most successful public-television miniseries in American history. The 11-hour Civil War didn't just captivate a nation, reteaching to us our history in narrative terms; it actually also invented a new film language taken from its creator. When people describe documentaries using the "Ken Burns approach," its style is understood: voice-over narrators reading letters and documents dramatically and stating the writer's name at their conclusion, fresh live footage of places juxtaposed with still images (photographs, paintings, maps, prints), anecdotal interviews, and romantic musical scores taken from the era he depicts. Continued below. The Civil War uses all of these devices to evoke atmosphere and resurrect an event that many knew only from stale history books. While Burns is a historian, a researcher, and a documentarian, he's above all a gifted storyteller, and it's his narrative powers that give this chronicle its beauty, overwhelming emotion, and devastating horror. Using the words of old letters, eloquently read by a variety of celebrities, the stories of historians like Shelby Foote and rare, stained photos, Burns allows us not only to relearn and finally understand our history, but also to feel and experience it. "Hailed as a film masterpiece and landmark in historical storytelling, it should be a requirement for every student." Sources: Clark, Walter. Histories of the Several Regiments and Battalions from North Carolina in the Great War 1861-65, Volume III; Official Records of the Union and Confederate Armies (ORs), especially Kirby’s report of April 13, 1865, Series 1, Volume. XLIX, Part 1; Sondley, Forster A. A History of Buncombe County (North Carolina) (1930), The Union Army (1908), Vol. IV; Story of the One Hundred and First Ohio Infantry. A Memorial Volume by L.W. Day. L.W. Day. 464 pgs. 2 vols. (1930); O.R., Series 1, Vol. XLIX, Pt. 1, pp. 19-32; Ohio In The War-Volume II. Whitelaw Reid. Moore, Wilstach & Baldwin. Cincinnati (1868); The W.M. Bayne Printing Co. Cleveland. Ohio (1894); Unit Bibliography. U.S. Army Military History Institute. Carlisle Barracks. PA. (1995); Trotter, William R. Bushwhackers: The Civil War in North Carolina, The Mountains (1988); National Archives (NARA); Library of Congress (LOC); National Park Service: American Civil War (NPS); North Carolina Office of Archives and History; North Carolina Museum of History; Jordan, Weymouth T. and Manarin, Louis H. North Carolina Troops, 1861-1865; Crute, Jr., Joseph H. Units of the Confederate States Army; Hill, D. H. Confederate Military History Of North Carolina: North Carolina In The Civil War, 1861-1865; Inscoe, John C. and McKinney, Gordon B. The Heart of Confederate Appalachia: Western North Carolina in the Civil War (2000); Asheville Citizen-Times, April 30, 2005; Barrett, John G. The Civil War in North Carolina (1963); Dyer's Compendium; North Carolina Convention June 1861. Papers North Carolina Convention (1861-1862); North Carolina Historical Review, Volume VII Number (January 1930). North Carolina Historical Commission; United States Military Academy; Ward, William, Clerk of Cadet Records. List of Cadets Admitted Into the United States Military Academy, West Point. United States Military Academy; Official Register of the Officers and Cadets. United States Military Academy. West Point; Jordan, Weymouth T. Editor, North Carolina Troops, 1861-1865, VI (1977); Official Register of the Officers and Cadets of the U. S. Military Academy (1884); McCoy, George W. The Battle of Asheville (1964); Harden, H. O. History of the 90th Ohio Volunteer Infantry in the War of the Great Rebellion in the United States, 1861-1865.